One of the places that kept coming up when I asked locals where to go was Aipim. They also specifically mentioned brunch being the time to try it so that became the plan for Sunday brunch. Using a handy, OpenTable like system, I booked a reservation for 1PM. I was slightly concerned about that time as I knew I would be having another epic meal the night before at OchoOnce. However, when I woke up on Sunday, I was surprisingly hungry again so off I went. 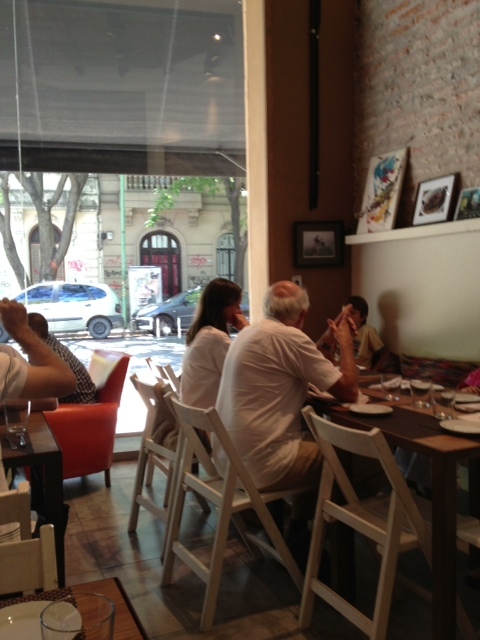 The restaurant was tiny – 30 seats but very nice and homey. There was no menu and the only thing to order was the multi-course brunch with came with fresh squeezed orange juice and coffee for $120 pesos. The very friendly host/server/bartender explained the concept and noted that it’s only two people running the entire place. He gave me a glass of delicious orange juice and said he’d be back shortly. In the meantime, a large group consisting of a multi-generational family came in and now the restaurant was full. It turned out to be a very wise idea that I made a reservation as the host had to keep turning away hungry looking patrons saying there was no space. 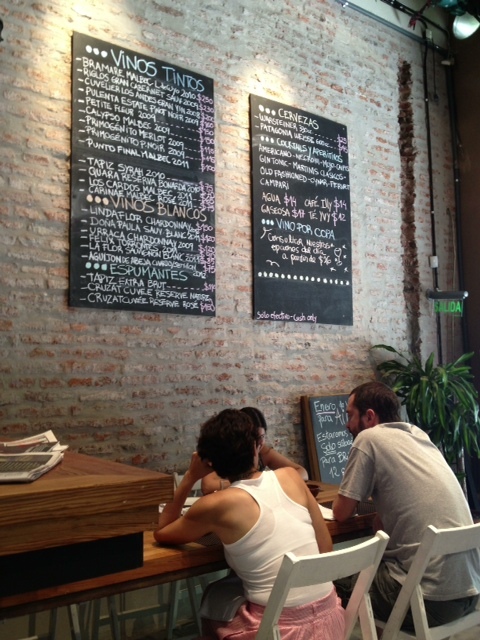 Having been in Buenos Aires for over a month, I had long become accustomed to shall we say less than optimal service. However, even by those standards, after about 40 mins with no food, I was becoming a bit annoyed. This turned out to be my fault as I had forgotten that the reservation had said 2 and the server was simply waiting for my other party to show up. Ooops. 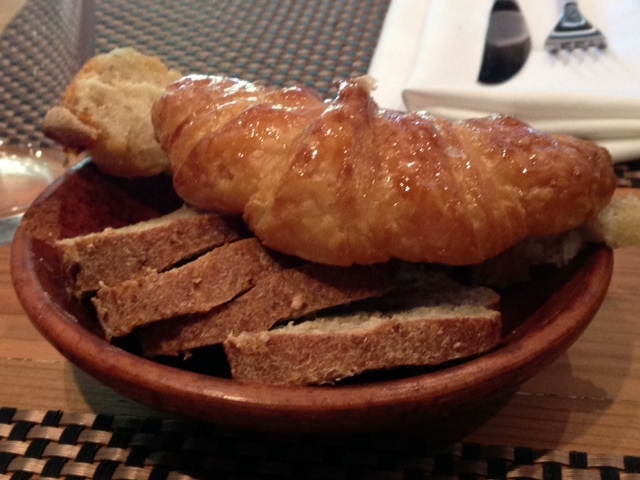 Finally, the food started arriving, first with a basket of fresh bread – a buttery, sweet croissant and some interesting bread with pieces of dried apricots in it. A nice way to kick off the meal. Since I was a bit behind the rest of the people there, the next course came out rather quickly. I had read that this was similar to the amazing lullo mousse I had at Hernan Gipponi and it was, just not quite as good. Still, the light whipped yogurt was nice and tart, contrasting with the sweet fruit that was layered in between. Really good. Next was, natch, an egg course. 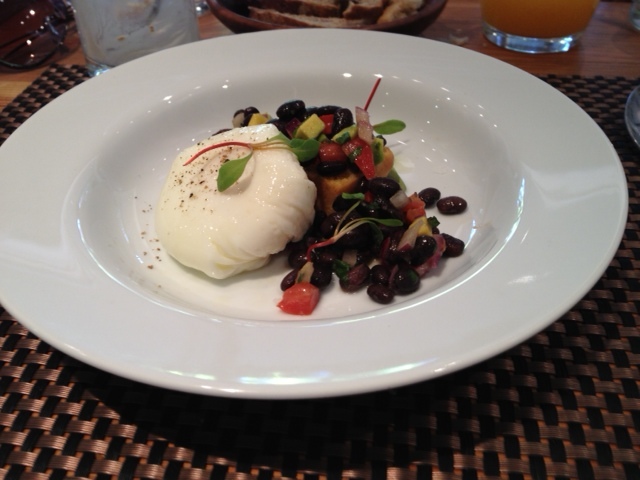 In this case, it was a perfectly poached egg with a black bean succotash and crispy bacon. I’m not a huge black bean fan so I maneuvered around those and focused on the other elements. This wasn’t my favorite of the bunch but still a nice egg dish. 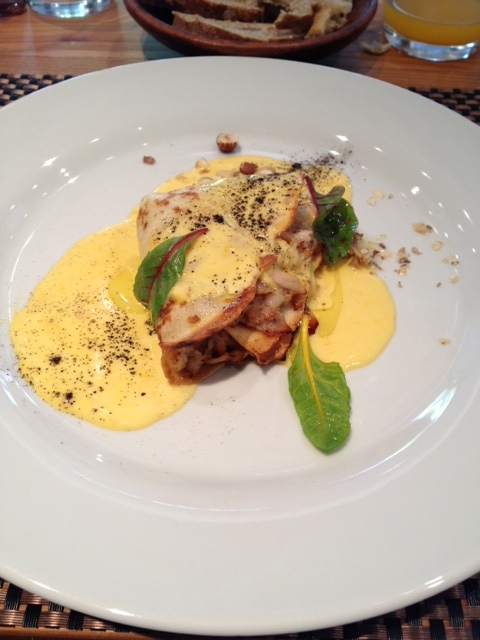 The main dish was the clear winner – braised rabbit crepes with walnuts and a Peruvian yellow pepper sauce. It was incredibly rich, savory and absolutely delicious. I couldn’t get enough of this but glad it was a relatively small size given how rich it was. I will come back for that someday, oh yes I will. 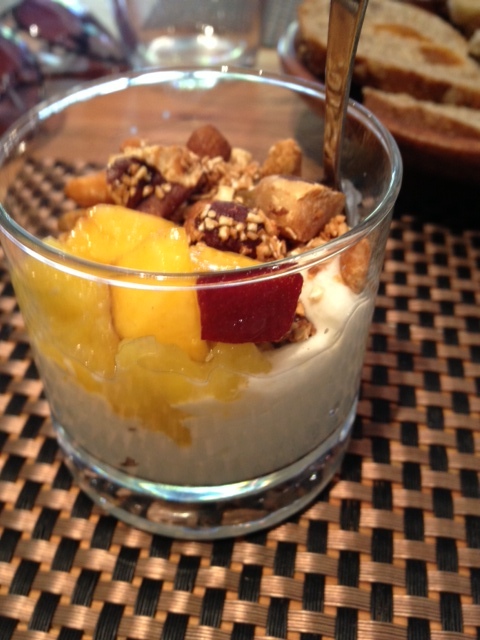 The final course was a bit of sweetness – mango pana cotta with sliced plums. 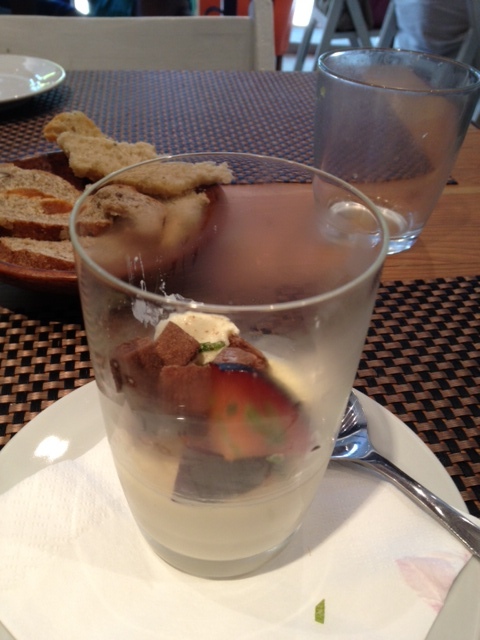 The pana cotta was just the right texture and given how hot it was outside, a nice refreshing finisher. I loved this place and cannot recommend it highly enough. Just make sure to make a reservation in advance or else face the same fate as the disappointed foodies I saw being turned away all meal. Posted on January 30, 2013 by reyalto. Bookmark the permalink.